Patent attorneys David Pressman and David E. Blau provide the latest information, forms, and clear instructions to help you to conduct a patent search the right way; to evaluate your idea's commercial potential; to file a provisional patent application to get "patent pending" status; to prepare a patent application focusing on your patent application's claims; to respond to patent examiners; to get your drawings done right; to protect your rights in foreign countries and deal with infringers, and to market and license your invention. The 19th edition covers the latest implications of the first-to-file rules created by the America Invents Act. 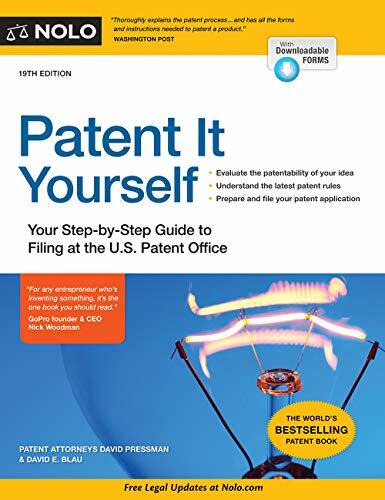 Inventor's notebook a "patent it yourself" companion by Fred Grissom & David Pressman. Find attorneys by specialty and check firm rating and reviews.